On the weekend of February 16th, just two days after the Parkland shooting, two of my closest friends and I decided we wanted to join the protest of gun violence and the lack of common sense gun control laws that allow mass shooting like the one in Parkland to occur so frequently. We were going to march in Washington D.C. We were going to march for the sake our lives being protected in schools, movie theaters and any other public place where our livelihood would be threatened. We booked a hotel room that very weekend and made our plans to create change in our home where our elected representatives proposed nothing to change the pattern of mass shootings that threatened us the most. 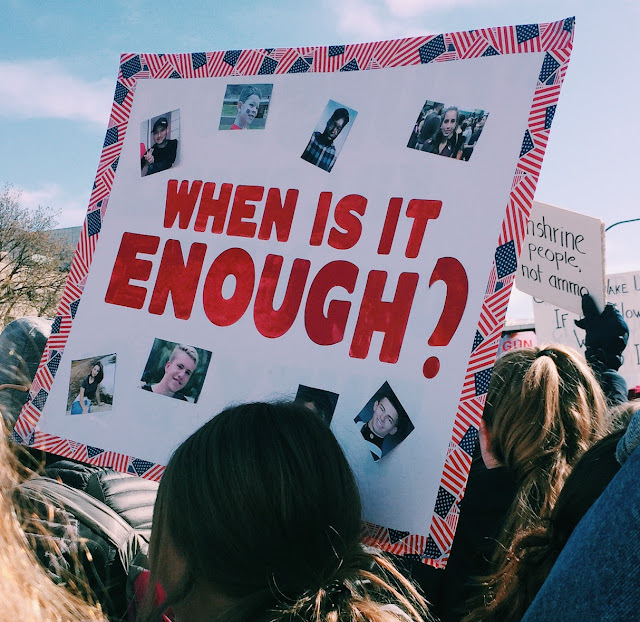 What I experienced at the March for Our Lives on March 24th is something I do not think I will experience again in my life. The combined feeling of hope, rage and sadness that filled me was a state of being I hadn't felt since the Women's March in Raleigh, NC, that I attended near my home when Donald Trump was first elected president in 2016. I felt hope because I was surrounded by hundreds of thousands of people who were supporting the same effort as me to save the lives of children in our country. 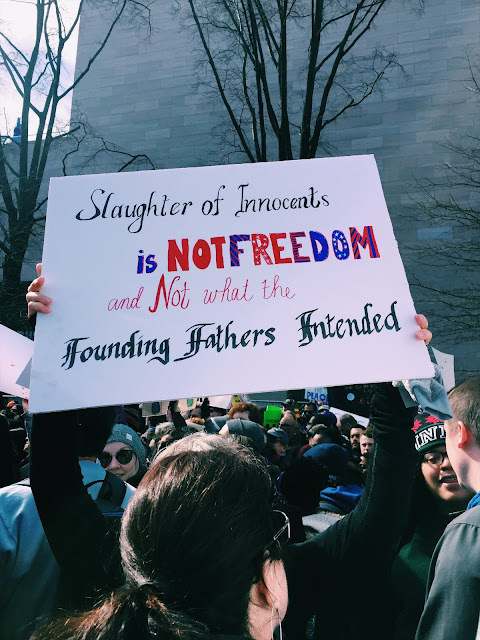 I felt hope that this march would make a difference in our society, which places more importance on keeping a 200 year old law than keeping its children alive. I felt rage. 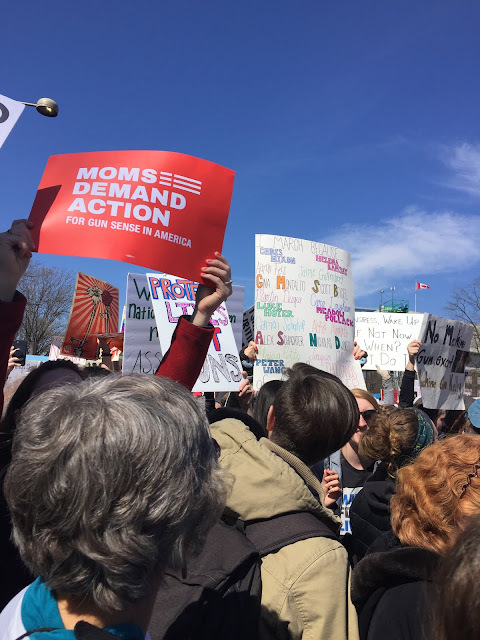 I was frustrated with the NRA and people who shut down the pleading mothers and fathers, brothers and sisters, who had lost people to gun violence for universal background checks and a ban on military grade assault weapons. The people who continue to support unrestricted gun ownership based purely on the second amendment tend to hide behind their computers and phones and post things degrading those who have lost their loved ones in tragedies. These people refuse to step out from behind their Facebook comments and look a weeping mother in her eyes and tell her they don't care she lost a child. I felt anguish. The pain and sadness in the eyes of people who had lost those they loves most in the world, all because our legislature wouldn't extend the assault weapons ban past 2004, brought tears to my eyes. I would like to call upon NRA spokeswoman Dana Loesch and Tomi Lahren and President Donald Trump to speak face to face with a mother or father who has lost their child to an AR-15 and then continue to tell them and the rest of the world to support reckless gun ownership laws that bring tragedy to families every single day. Look them in their weeping eyes and tell them you don't believe in doing anything to prevent these tragedies. That is the evil we marched against. The evil of inaction and complacency. The evil of disingenuine sympathy with "thoughts and prayers." 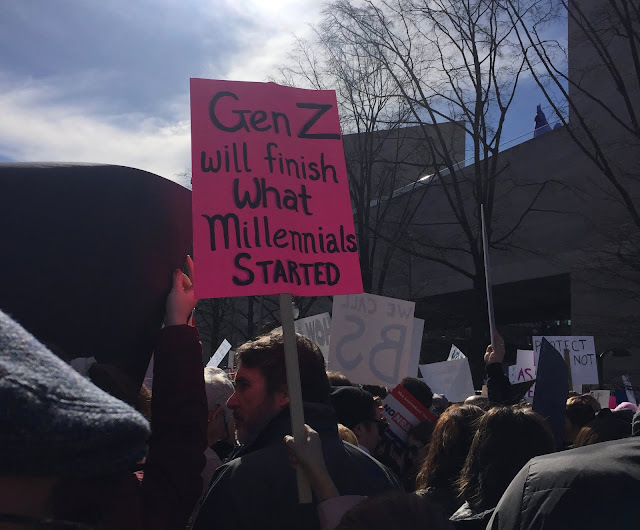 However, the march for our lives wasn't purely against things, it was for our lives, for al lives. It was for black lives, for children's lives, for women's lives, for all of our lives. As I stood in the crowd and chanted, "This what democracy looks like," I knew that the country that supported our lives was still there, it just needed a little dusting off and waking up.